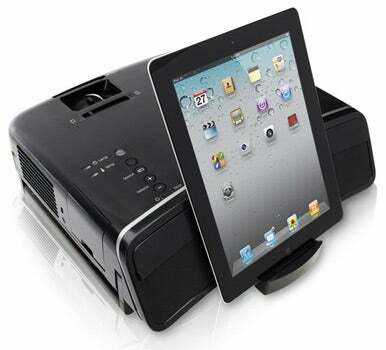 The Epson MegaPlex MG-850HD is a portable projector with two built-in ten-watt speakers, bright 2800 lumen output, and a dock for connecting and playing movies and music from your iPhone, iPod touch, or iPad. Weighing in at 8.4 pounds, the piano black MegaPlex is compact and easily portable. It uses 3LCD technology and offers native 720p resolution in screen sizes from 33 to 320 inches diagonally. Aside from the iOS device dock, the MegaPlex offers VGA, HDMI, Composite, Component, mic, and USB inputs. Using DisplayLink, the MegaPlex allows you to mirror your Mac’s desktop and audio to the projector using USB 2.0. DisplayLink requires software to be installed on your Mac, but conveniently, the installer mounts on your Mac automatically as soon as you connect the USB cable between the Mac and projector. Once you install the driver, a little icon appears in your Mac’s menu bar in the top right of the screen. An installer message popped up at the end of the process stating that a restart was necessary, but I didn’t have to restart before using the USB DisplayLink connection. The MegaPlex has auto vertical keystone correction and iris controls, as well as manual focus and zoom rings near the lens and a horizontal keystone adjustment just behind them. You can tilt the front up with an adjustment leg beneath the front of the projector. You can correct horizontal tilt by adjusting the height of the feet at the back of the projector. Manual adjustments can be made through the menu system using the included remote control. There are seven different color modes to choose from including Blackboard (for projecting onto a dark green chalkboard), and four audio modes including Vocal, which emphasizes voices and dialog during video playback. Using your iPhone with the MegaPlex is easy. There’s a little pop-out dock connector that fits the iPhone or iPod touch. To use an iPad, you’ll need to use the included iPad bracket. Once docked, folders for you Video and Music are projected on screen. You use the remote control to choose which type of media you want to enjoy. Select Video and subfolders appear with Movies, TV shows, Music Videos, and Movie Rentals. Select Music and you can browse by artist, album, playlist, etc. You can only watch videos that are in your iTunes library using these menus—however, a movie or TV show from iTunes must be fully downloaded before it will show up in the Epson’s Video file browser. Considering how long it can take to completely download a two-hour HD movie from iTunes, you’ll definitely want to plan ahead. If you want to watch YouTube videos or view photos and video taken with your iOS device, there’s button on the remote control that lets you use the iOS device’s menus to choose videos and photos. You can also use the MegaPlex to play slideshows from photos on connected USB drives. When displaying movies from the iPad, the MegaPlex’s picture was bright and sharp. Presentations and photo slide shows from the Mac also looked great, with pleasing color and good amount of detail. Mirroring full-screen video from the Mac over USB resulted choppy motion and is not recommended, as the bandwidth through USB is limited. For video playback from your Mac, connecting to the projector from your Mac’s video port provides much smoother performance. Audio played through the two ten-watt speakers was clear and plenty loud, though a little thinner sounding than the MovieMate 85HD ( ). My only real complaint, however, had to do with the sound of the whirring fan. The specifications cite a 35 dB noise level in Normal mode and 29 dB in Eco mode. The MegaPlex fan sounded louder than the MovieMate 85HD, though that projector’s specifications were similar at 33 and 28 dB, respectively. The fan noise on the MegaPlex will have to be taken into account when deciding on placement. Sure, the projector’s speakers can get loud enough to drown out the fan, but you’ll want to be a few feet away from the MegaPlex when watching movies, and you’ll also want to keep the area near the fan clear due to the heat the unit puts out. If you’re looking to watch the video on your iPad or iPhone on a screen up to 320 inches across, the MegaPlex MG-850HD can accommodate. The direct mirroring of your Mac’s desktop with audio to the projector over USB is handy, but the speed of the connection seems too slow to provide smooth motion in full screen movies.